I hope everyone is having a good week and that you have some fun weekend plans. Brian and I are going to go out to dinner tomorrow night to celebrate Valentine’s Day early! Is anyone else celebrating Valentine’s Day this weekend? He has to travel and will be gone most of Valentine’s Day, plus the kids have activities on Thursday night anyway. This week has been really challenging, Autumn ran a fever ALL week (more on that below), so I am excited for a night out with Brian. Nathan is doing a solo audition with his clarinet tomorrow (wish him luck!) and I have a hair appointment, which is 4 weeks late since the big snow storm canceled my original hair appointment. Whew! So, cheers to the weekend!!!! Let’s start with the YUCK, then we’ll get to the fun stuff. My poor Autumn has been sick since last Friday. She even missed her dance convention over the weekend. And, several days this week more than half of her class was out sick, most of them sick the entire week of school! On Tuesday, I had BOTH kids home sick AND American Water decided to to do maintenance work and we had no water from 9 a.m. till 4 p.m.! It has been a CRAZY week, folks! 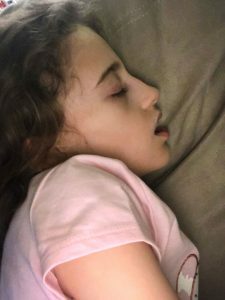 Then on Thursday I took Autumn back to the doctor, because her fever spiked again and she was put on antibiotics for a touch of pneumonia. I just want my girl to get better soon! It’s sooo stressful when they get sick and the fever just lingers for days and days! I think she is almost back to normal, her temp was 98.8 this morning and was in the lower 90’s all of yesterday. A 7 day fever is NO joke folks. I really can’t remember either of my kids having a fever that long. I think Nathan may have had a 4-5 day fever in 3rd grade? It definitely started to stress me out a bit on day 4 and I may have went to bed with some tears. It’s hard for a mom not to worry! I really hope we are on the mend now. We have two summer vacations planned and I am excited about both. My husband volunteered to plan the vacation that we take with each other (our kid free trip) this year and we’re going to Maui!! We are using Kellyann’s travel agent for this trip and she has been great. 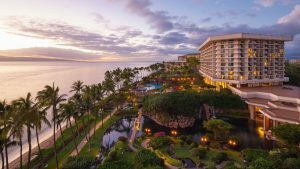 We decided to book the Hyatt Maui Resort and it is GORGEOUS. We’re planning some activities, such a tour (with a driver) to Hana, which is a little village on the far end of the island. The road to get there runs along the back of Maui and it’s really really scenic with a lot of waterfalls and pacific island scenery. We’re also going to do a sunset dinner sail and the Old Lahaina Luau. The rest of the time we’ll be enjoying the beach, soaking up some sun, exploring and enjoying each others company. There are a lot of animals on the resort grounds, even penguins (seven of them!). I’m so excited to go! 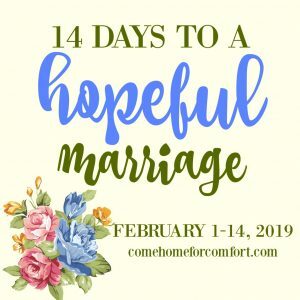 I’ve been following Whitney from Come Home for Comfort on Instagram for several years and when I saw her mention her ‘14 Days to a Hopeful Marriage‘ free challenge, I knew I wanted to do it! The challenge started on February 1 and it ends on February 14, with easy 5 minute or less prompts to do each day. These include simple verse passages to read, prayers and even kind gestures to surprise your husband with, such as: ‘Find a picture of you and your husband – text it to him with the reason why you love that picture of you together.’ I’m all about growing my marriage day to day and this is a wonderful, Godly way to do it! And, I love that she launched this challenge around Valentine’s Day. Since Autumn was sick most of this week, I am a little behind… but, I plan to pick back up on it to finish it out. I’ve been doing FabFitFun for about 2 years now and I just LOVE each and every box. The Spring box will be out soon and since I’m a Select Access Member, I get to select several of the items that will be in my box. This month’s box has some stellar items in it! I’m SO pumped! I think I’m the most excited about the floral robe that I selected for this month, the other option was an aromatherapy diffuser (another GREAT item!). I’m going to take this floral robe with me to Hawaii and it’ll be great for flatlays or beauty blog posts!! I’m excited about the picnic set with plates and silverware. I love picnics and the coral colored pouch to store everything in is so cute. The copper measuring spoons are adorable and I can always use more of those in the kitchen! I can’t wait to see what else (the surprises!) 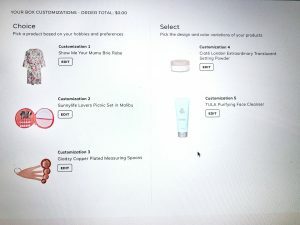 are in this Spring 2019 FabFitFun box. 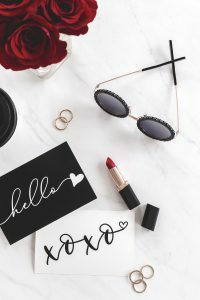 You can sign up to receive the Spring FabFitFun box HERE and save $10 off it! I usually give myself one area in the house to cleanup at a time. The last area I cleaned up and organized was our garage. Now that I’m done with that, I’ve been working on my craft area downstairs in our finished basement. 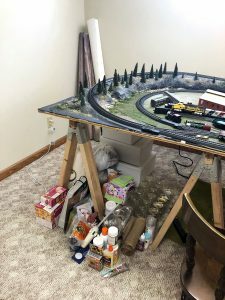 I have a desk/office space downstairs, but somehow I started piling all of my crafting ‘extras’ in this corner in the basement under Nathan’s HO train table. These photos are AFTER I went through everything and donated what I hadn’t used in over a year to Goodwill. Now, I need to work on finding a better place for these items, so that they’re not just laying on the floor! This is my ‘photo props’ pile of items! I have table linens, stands/trays, etc. 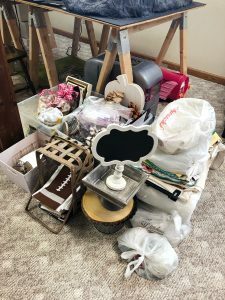 Just everything I use for my recipe and DIY/decor photos. I’ve decided that for the table runners, mats, etc. 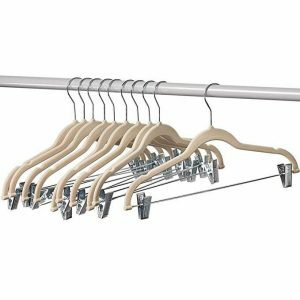 I am going to purchase a clothing rack with those clip hangers that I can attach the runners, mats, etc. to. That way, I can see them all on the clothing rack and organize them by season/holiday, etc. It’ll be SO much better than just piling them on top of each other. 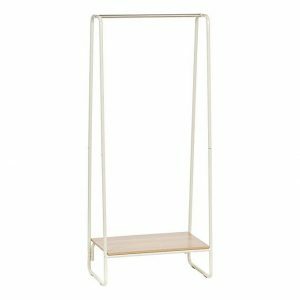 I really like this gold clothing rack with the wooden base that is off of Amazon. These hangers from Amazon with the clips on them will be perfect for hanging table runners, linens and mats. 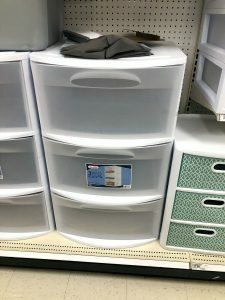 For the photo props, I’m planning on buying either 2 or maybe even 4 (if I can stack one on top of the other) of these HUGE storage tubs at Target. I plan to label the front of each pull out drawer with the season/holiday and then I can place all of the photo props in there for easy access. I can pull the drawers out and bring them upstairs when I work on my blog posts. It’ll be such a better way to organize all of these little items! This photo doesn’t do justice in showing how large they are, but each drawer stores A LOT! I plan to move these closer to my office space in the basement. 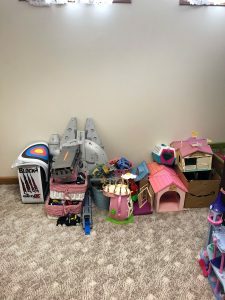 Autumn has made the finished basement her play area and there is about 3-4 areas with just PILES of toys. I know her toy phase is going to be over very soon, but although I’m sad to see it end… I’m also ready to get my basement back! Lol! This shows a lot of her toys, Nathan’s old toys and even some of my old childhood toys! This was a HUUUGE pile of toys and I dwindled it down to just what you see in the above photo. I have 3 more areas to work through in the basement of toys and then I hope to move them all to one spot and organize them a bit better. And, of course… it’s crazy to think that now that my youngest is almost out of toys, I need to decide which to keep for grandkids (eek!) someday. That is a ways off, though. LOL!! !